Alright folks, today is September 21st and Fall has officially arrived and I’m kicking the season off with one of my favorite veggies, the delicata squash! I always say this, but why, oh why did I wait so long to try these? They are amazing. And roasted up? Holy cow, simply perfection. They develop this faint sweetness and a hint of smokiness along the crispy edges that pretty much scream fall. 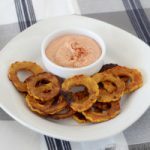 Once I tried it, I knew it would go perfectly with the sauce that I created for my baked onion. Just gonna say it, it’s a knock off of the dipping sauce from Chili’s Awesome Blossom. You know what the secret ingredient in there is? Horseradish. Don’t let that scare you though. It’s not spicy and overwhelming but just adds a bit of zippiness to the sauce that complements the flavors of the squash. And do you want to know what else makes this the quintessential fall recipe? It’s PERFECT for football watching. 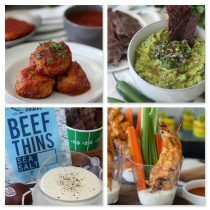 Pretty much anything you can dip is but when you can make it healthy and can feel good eating it while your team wins? I’d say that means it’s a keeper. I’ve also been making it like crazy for our side dish at dinner. The dipping action is all it takes to get the kids to love it which makes life so much easer at the dinner table. This recipe is pretty much a no-brainer. Olive oil, salt, smoked paprika and drizzle, sprinkle, rub. 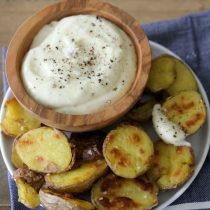 A perfect roasted delicate chip with dipping sauce. Great as a side or football snack. Paleo, vegetarian and Whole30 compliant. Preheat oven to 375* and line a baking sheet with parchment paper. In a bowl toss squash with olive oil and a sprinkle of smoked paprika then bake for an additional 10 minutes. In a small bowl combine mayo, tomato paste, horseradish, seasoning and a pinch of salt. Serve alongside the squash. I don’t see why not! The cooking times may vary slightly so just watch for that. Do you cut it in half (the short way) and then scoop out the seeds? Or slice thinly and then poke the seeds out? Just wondering the best method. Thanks! Wait, did the recipe used to say to sprinkle salt on them before cooking where it now says paprika? Or did I misread last night and think I was supposed to salt before roasting? Either way, this explains why I thought they tasted overly salted! Ha! Now I am excited to try again w/ paprika instead! Sorry, one more question! The post mentions paprika but the recipe & ingredients list do not. Can you clarify please? Thanks! Yes! Just corrected it, thanks for noticing! Does the horseradish need to be fresh? Can I use the one now at trader joe’s that in the jar? They just brought it back for the holiday season. What do you recommend as the best way to slice the squash? Tried to slice with my mandolin and had some issues. I actually just use a knife and haven’t had any issues! Just make sure your knife is sharp enough! 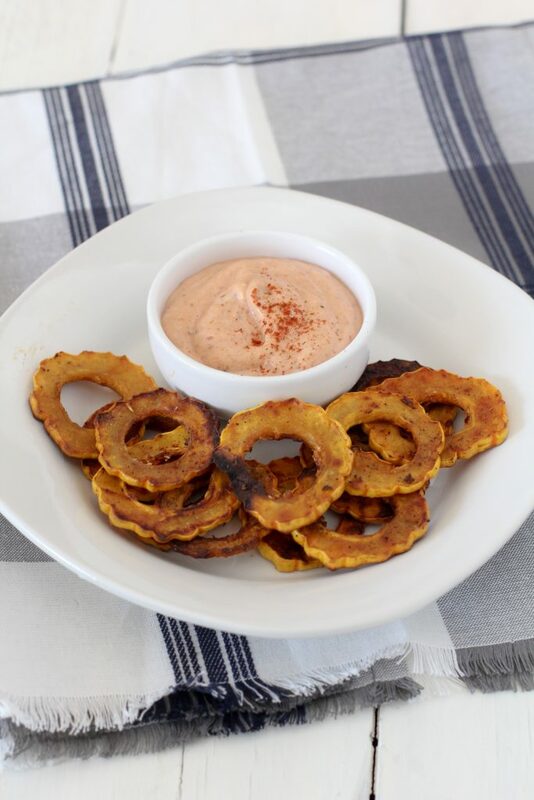 Pingback: Delicata Squash Chips + “Awesome” Sauce from the Whole Smiths. A MUST make for any party. 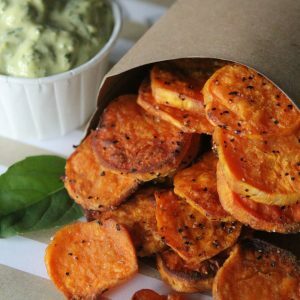 Gluten-free, paleo, Whole30…. Can you prepare these in advance? This looks like a great Super Bowl party snack! Trying to picture what the Delicata squash looks like? I finally got up the courage to cook my deliata squash tonight and I am sooo sad that I waited so long. This recipe was DELICIOUS. I ate the whole squash by myself (it was a small one). Will definitely be making this one again very soon! Probably a dumb question, but do you peal the squash?